The configuration is very easy using the RMGUI, stability/scalability is not a problem. The automatisation of the replication process is the most valuable feature. Before we used to manually synchronize the replica volumes with source ones, then mount replica volumes on target servers, then starting databases with new parameters. 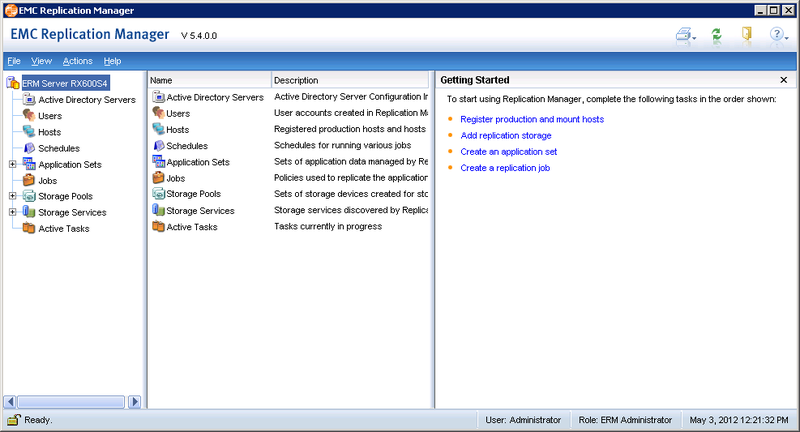 With Replication Manager we just configure/schedule the replication process once and the work is done automatically. The product can be used to create/refresh an environment similar to production one. The replica environment can be used for test&dev or backup reasons. The replication process can be scheduled with Replication Manager and this is a real benefit: Imagine that you need the image of your production environment at midnight. No employee is available at this time to do the work, but with Replication Manager schedules you can do it whitout problem. Replication Manager is an orchestrator of Replication: it uses several products to enhance the replication automatisation. I think that the compatibility matrix should be extended, especially with UNIX environments. 17 months from June 2012 to Novembre 2013 : I've tested the product on local lab, then installed it on a customer site and accomplished support/maintenance tasks. Yes, due to incompatibility between Replication Manager 5.4.0 and VXVM5.0 (HPUX): The replica didn't mount successfully on target host in the beginning. This issue was resolved after Replication Manager 5.4.2 version was released. When I deployed the Replication Manager and detected issues, I found that the technical support was not really helpful because they spent a lot of time to found a hotfix which resolved my problem. I think that now the product is more mature and technical support also. No, we used scripts and manual interventions to create/refresh a replica environment. I think that with newer versions the setup should be easy to complete. I was part of the vendor (partner) team which implemented the product on customer site. Since I had the opportunity to test Replication Manager on local lab, I think that my level of expertise was good. Test&dev environment takes less time to come up and now it is always consistent thanks to replication manager. I don't have exact numbers but I think that fact should have a very good impact. I am not an end user and I work for an EMC partner. So for replication automatization requests we suggested Replication Manager directly and customer bought it. Go on, you'll enjoy using it. Once set up, the configuration is very easy using the RMGUI, and stability/scalability is not a problem.